Plato,the Athenian philosopher, was born in 428 BC and died at the age of eighty in348 BC. These dates, however, maynot be entirely certain, as, according to Apollodorus' chronology, Plato was born in the year Pericles died, who was six years younger thanIsocrates and died at the age of eighty-three. If Plato's date of death is correct in Apollodorus' version, Plato would have been born in 431 BC. Despite the confusion, the dates of Plato's life, which are based on Eratosthenes' calculations, have traditionally been accepted as accurate. According to a disputed tradition, reported by Diogenes Laertius, Ariston, Plato'sfather, traced his descent from the king of Athens, Codrus, and the king of Messenia, Melanthus. Plato's mother was Perictione, whose family boasted of being related to the famous Athenian lawmaker and lyric poet, Solon.Perictione was the sister of Charmides and the niece of Critias, both prominent figures of the Thirty Tyrants, the brief oligarchic regime, which followed the collapse of Athens at the end of the Peloponnesian War (404-403 BC). When Socrates died, Plato left Athens, staying first in Megara, andthen traveling to several other places,including perhaps Italy and Egypt. Evidence may be found for his visit to Italy, especially in the Seventh Letter. According to the account given there, Plato first went to Italy when he was about forty. However, in the end, Plato returned to Athens and founded a school known as the Academy from where the word "academic" is derived. The Academy got its name from its location, a grove of trees sacred to the hero Academus -- or Hecademus -- a mile or so outside the Athenian walls; the site can still be visited in modern Athens.In 348BCPlato died, leaving the Academy to his sister's son, Speusippus. 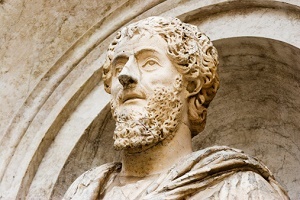 The Academy remained a model for institutions of higher learning until it was closed in 529 BC by the Emperor JustinianI of Byzantium, who saw it as a threat to the propagation of Christianity. Many intellectuals were schooled in the Academy -- the most prominent being Aristotle. Throughout his later life, Plato wasentangled inthe politics of the city of Syracuse. While staying in Syracuse, he became instructor to Dion -- the brother-in-law of the tyrant Dionysius I.According to doubtful stories from later antiquity, Dionysius became annoyed with Plato at some point during his visit, and arranged to have the philosopher sold into slavery.In 367 BC, Plato was invited to be the personal tutor to Dionysus II- the new ruler of Syracuse. Plato accepted the invitation, but on arrival herealized that the situation was not conducive for philosophy. He continued to teach the young ruler until 365 BC, when Syracuse entered into war. However, finding the situation even more unpleasant than his first visit, he returned to Athens almost as fast as he had come. After 399 BC, Plato began to write extensively. It is still up for debate whether Platowas writing before Socrates' death, and the order in which he wrote his major texts is also uncertain. However, most scholars agree to divide Plato's major works into three distinct groups. The first of these is known as the Socratic Dialogues because of how close he stays within the text to Socrates' teachings. They were probably written during the years of his travels between 399 BC and 387 BC. One of the texts in this group known asthe Apology seems to have been written shortly after Socrates' death. Other texts relegated to this group include the Crito, Laches, Lysis, Charmides, Euthyphro, and Hippias Minor and Major.The period from 387 BC to 361 BC is often called Plato's "middle" or transitional period. It is thought that he may have written the Meno, Euthydemus, Menexenus, Cratylus, Republic, Phaedrus, Symposium, and Phaedo during this time. The major difference between these texts and his earlier works is that he tends toward grander metaphysical themes and begins to establish his own voice in philosophy. However,Socrates still finds presence sometimes as a fictional character. For example,in the Meno, Plato writes of the Socratic idea that no one knowingly does wrong, and adds the new doctrine of "recollection questioning" whether virtue can be taught. In the Phaedo we are introduced to the Platonic doctrine of "the forms", in which Plato makes claims as to the immortality of the human soul. The middle dialogues also reveal Plato's method of hypothesis. Plato's most influential work - The Republicis also a part of his middle dialogues. It is a discussion of the virtues of justice, courage, wisdom, and moderation of the individual and society. It works with the central question of how to live a good life, asking what an "ideal state"would be like and what defines a "just individual". These lead to more questions regarding the education of citizens, how governments should be formed, the nature of the soul, and the afterlife. The dialogue finishes by reviewing various forms of government and describing the "ideal state", where only philosophers are fit to rule. The Republiccovers almost every aspect of Plato's thought.His final years at the Academy may be the years when he wrote the "Later" dialogues, including the Parmenides, Theatetus, Sophist,Statesmas,Timaeus,Critias,Philebus, and Laws. Socrates has been delegated a minor role in these texts. Plato uses these dialogues to take a closer look at his earlier metaphysical speculations. He discusses art, including dance, music, poetry, architecture and drama, and ethics in regard to immortality, the mind, and realism. He also works with the philosophy of mathematics, politics, and religion -- covering specific areas, such as censorship, atheism, and pantheism. In the area of epistemology, he discusses "priori knowledge" and "rationalism". In his theory of "forms", Plato suggests that the world of ideas is constant and true, opposing it to the world we perceive through our senses, which is deceptive and changeable. Platonic realism: "Platonism" is a term coined by scholars to refer to the intellectual consequences of denying (as Plato's Socrates often does)the reality of the material world. In several dialogues, most notably the Republic, Socrates inverts the common man's intuition about what is "knowable" and what is "real". While most people take the objects of their senses to be real if anything is, Socrates is contemptuous of people who think that something has to be graspable in the hands to be real. In the Theaetetus, he says that such people are "eu a-mousoi", an expression that literally means, "happily without the muses". In other words, such people live without the divine inspiration that gives him, and people like him, access to higher insights about reality. Theory of forms: The "Theory of Forms", or Theory of Ideas, typically refers to the belief that the material world as it seems to us is not the real world, but only an "image" or "copy" of the real world. In some of Plato's dialogues, this is expressed by Socrates, who spoke of forms in formulating a solution to the problem of universals. The forms, according to Socrates, are archetypes or abstract representations of the many types of things, and properties we feel and see around us that can only be perceived by reason (i.e., they are universals).In other words, Socrates recognized two worlds: the apparent world, which constantly changes, and an unchanging and unseen world of forms, which may be the cause of what is apparent. Platonic epistemology: Many have interpreted Plato as stating -- even having been the first to write -- that knowledge is justified true belief, an influential view that informed future developments in epistemology. This interpretation is partly based on a reading of the Theaetetus, wherein Plato argues that knowledge is distinguished from mere true belief by the knower having an "account" of the object of her or his true belief (Theaetetus 201). This theory may again be seen in the Meno, where it is suggested that true belief can be raised to the level of knowledge if it is bound with an account as to the question of "why" the object of the true belief is so (Meno 97).Many years later, Edmund Gettier famously demonstrated the problems of the justified true belief account of knowledge. That the modern theory of justified true belief as knowledge, which Gettier addresses, is equivalent to Plato's, is accepted by some scholars but rejected by others. The Republic: Plato's philosophical views had many societal implications, especially on the idea of an "ideal state" or "government". There is some discrepancy between his early and later views. Some of the most famous doctrines are contained in the Republic (during his middle period) as well as in The Laws and The Statesman. However, because Plato wrote dialogues, it is assumed that Socrates is often speaking for Plato. This assumption may not be true in all cases. Plato, through the words of Socrates, asserts that societies have a tripartite class structure, corresponding to the appetite/spirit/reason structure of the individual soul. The body parts symbolize the castes of society. Productive, which represents the abdomen. Workers - Laborers, carpenters, plumbers, masons, merchants, farmers, ranchers, etc. These correspond to the "appetite" part of the soul. Protective, which represents the chest. Warriors or Guardians - The adventurous, strong, brave and the armed forces. These correspond to the "spirit" part of the soul. Governing, which represents the head. Rulers or Philosopher Kings - The intelligent, rational, self-controlled, in love with wisdom, are well suited to make decisions for the community. These correspond to the "reason" part of the soul, and are very few. "Until philosophers rule as kings or those who are now called kings and leading men genuinely and adequately philosophize, that is, until political power and philosophy entirely coincide, while the many natures who at present pursue either one exclusively are forcibly prevented from doing so, cities will have no rest from evils, nor, I think, will the human race." Apart from his known works, for a long time, Plato's unwritten doctrinewas controversial. 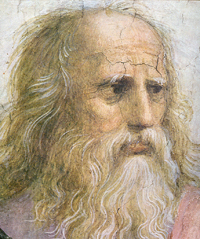 Many modern books on Plato seem to diminish its importance; nevertheless, the first important witness tomention its existence wasAristotle, who in his Physics writes: "It is true, indeed, that the account he gives there (in Timaeus) of the participant is different from what he says in his so-called unwritten teachings (ἄγραφα δόγματα)." The term ἄγραφα δόγματα literally means unwritten doctrines and it stands for the most fundamental metaphysical teachings of Plato, which he disclosed only orally (some say, only to his most trusted fellows), and which he may have kept secret from the public. The importance of the unwritten doctrines does not seem to have been seriously questioned before the nineteenthcentury.A variety of sources have given accounts of Plato's death. One story, based on a mutilated manuscript, suggests that Plato died in his bed, whilea young Thracian girl played the flute to him. Another tradition suggests Plato died at a wedding feast. The account is based on Diogenes Laertius's reference to an account by Hermippus, a third-century Alexandrian. According toTertullian, Plato simply died in his sleep.